The first version is a firm favourite so another had to be made. If you missed the other one it is here. I stuck with woven fabric again but this time went for a soft flannel with a pretty small scale rose print. The nights and early mornings are still quite chilly here at the moment so all things brushed and snuggly are staying out for now! I wasn't impressed with the quality of the trim I used last time and went looking for another supplier. I found this crochet cotton trim on ebay and am over the moon with the feel and the quality of it. It sewed on so smoothly. I will be ordering some more that's for sure! I really wanted to do the lace trim around the bottom this time, but was heartbroken to discover I was short by about 12" and so had to hem it again. I only turned up a single hem of 1/4" and decided to do a fancy machine embroidery stitch to liven things up a bit. It just about catches the hem in regular enough intervals to hold it up and doing it this way didn't take off too much length. Which is what I was trying to avoid. So now I have two blog posts in a row about the same pattern. Have I been doing anything else in between you ask?! Well yes of course I have! I recently made a birthday present for a friends little girl who turned 4 last week. 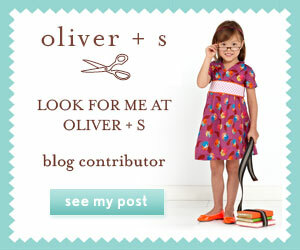 I chose the big and little versions of the Oliver + S Tea Party Dress. The dolls version is from the Little Things to Sew book. I only bought a fat quarter of the heart print fabric and it was just enough to do the dolls dress and the bodice of the big girls size 4 dress. I lined the larger dress with some white dobby print cotton. There wasn't enough to do the contrast hem on either dresses but since I lined the big dress anyway, there was no need for the hem piece. I think you have to make matching versions of this pattern at least once in your life. It was a lot of fun and the birthday girl looked happy! The nightie is so pretty Katy - perfect for snuggling in. Thanks justine. When it comes to birthday present shopping I am not actually that good, I can never decide. I prefer to make them something that shows I have given it some thought. Plus I get to sew something! Thanks Shelley! But how cute would a dolls Pinwheel dress be? I think Liesl should do a mini range......just saying! That nightgown looks so cozy and sweet. Love the little trim! Thanks! Flannel turned out to be a good choice, it is very snuggly.